Liberal fantasies about Obama’s power to bend intransigent Republicans in Congress to his will are not helping. President Obama has come under fire recently. Which is not surprising given the blatant partisanship of Republicans in Congress. It’s a matter of course that the Fox News’, Red States and World Net Dailies of the world would be quick to pile on Obama as a “failure.” But what is surprising is that this time the fire is of the “friendly” variety, coming from more liberal bloggers and opinion writers. And with the Senate’s failure to pass the Manchin-Toomey gun background checks bill, the uproar of criticism toward Obama headed toward a fever pitch. The cavalcade began with New York Times columnist Maureen Dowd and her piercing commentary about how it’s Obama’s job “to get them (Congress) to behave.” The liberal doubters—nay, Progressive doubters—took that as the green light to pile on, and the avalanche had begun. Right, because Mitch McConnell, John Boehner, Eric Cantor, Ted Cruz, Rand Paul, and Paul Ryan have all been perfectly reasonable and eager to work with this black, Democratic, communist, socialist, illegitimate president in the first place. They’re just dying to reach out and collaborate with him, if only he’d ask nicely. Right, Darrell Issa? All we need is Paul “Bear” Bryant on the case. What is unconscionable to these folks is that a gun background checks bill (and really, that’s all it was—Dianne Feinstein’s assault weapons ban was left completely out of it, as was an amendment that would limit the size of magazine clips) could fail in the Senate when polling nationwide showed close to 90% support for the concept. With 90% of the American public supporting the notion of expanding background checks on who could legally purchase a gun and who would be legally prohibited from doing so, how could that bill possibly fail? According to Dowd, it’s clearly Obama’s fault: He didn’t do nearly enough arm twisting and cajoling and schmoozing, and because of it he couldn’t muster up enough support to pass it. Never mind that the bill earned 54 votes in the Senate, a clear majority. This stacked on top of Obama’s inability to coerce Congressional Republicans to negotiate in good faith on the debt ceiling, sequestration, the budget deficit, Medicare, Medicaid, Social Security…….In short, his inability to convince the opposition party to behave as a responsible governing entity instead of strictly an obstructionist presence. What should be telling is the agenda in the House of Representatives, led by a Republican majority. In short, there is none. They don’t hope to accomplish anything, other than preventing Obama “victories.” There are no goals laid out, no priorities set. Just obstruction. And never mind that today’s Senate requires a 60 vote supermajority to accomplish anything, rather than a simple majority as the Founders had intended, thanks entirely to the cowardice of Senate Majority Leader Harry Reid. But what this really indicates is a fundamental misunderstanding of Obama and his approach to governance on the part of some otherwise really smart people. Quick lesson in Constitutional Law: Bills that would become law—particularly as it pertains to revenue and the budget—must originate in the House of Representatives. Congress makes the laws, not the President or the Judiciary. That changed under FDR, who used the crisis of the Great Depression to change the way the government functioned. The Roosevelt White House wrote the bills that would ultimately constitute the New Deal, and proceeded to promote it through Congress—with large majorities of Democrats in both houses. LBJ did the same with the Great Society—again with large Democratic majorities. George W. Bush’s White House wrote the disastrous prescription drug bill that required extensive arm twisting and procedural tricks in the House to pass through a Republican dominated House and Senate. Congress had become lazy through the decades, expecting the Executive Branch to do all of the heavy lifting on important legislation while they got to sit back and take the credit for someone else’s work. But that’s not the way it’s supposed to happen, and Obama, being a Constitutional scholar and law professor, knows this. So instead of spoon-feeding Congress as other recent presidents have been wont to do, Obama decided that it was time for Congress to actually earn their paychecks and do what they are Constitutionally obligated to do: Legislate. This is how the Affordable Care Act (or Obamacare, as was formerly the pejorative until the president decided to own it) came to be. The Obama White House, instead of writing the bill and attempting to walk it through Congress, came up with a framework and set Congress off with the task of actually writing the law, a near complete departure from how important legislation had been handled in the past. Lawmakers, for once, had to actually do the legwork themselves and create the law from scratch. It certainly didn’t hurt that in 2009 Obama had large majorities from his own party in both chambers, as had his predecessors. This is something that seems completely lost by many in the liberal commentariat these days. This was also Obama’s approach to handling the gun bill. Provide a framework and let Congress hash it out as they’re supposed to do. Only, since the Republican led House has no interest in actually doing anything whatsoever—they might as well be in a state of permanent adjournment—the Democratic led Senate took up the task with a bi-partisan effort led by Pennsylvania Republican Pat Toomey and West Virginia Democrat Joe Manchin. It was certainly a less than stellar effort, but at least it was an effort, a good and decent start. ‘A’s’ all around for them. The bill failed because Mitch “Our goal is to make Obama a one term president” McConnell and his horde of obstructionists refuse to do anything that even hints at this president being anywhere close to acceptable. They filibustered, which today simply means nothing more than a 60 vote threshold to even function. But let’s, for a moment, assume that the president, exasperated by a dysfunctional Senate and a non-functional House of Representatives, decided to be more proactive and add the legislative duties of Congress to the Executive Branch. Would anything change? That might have worked prior to 2011, but in an era where if Obama suddenly had a change of heart and decided that a 20% across the board tax cut was the surest path to economic recovery, the Republicans would stumble all over themselves to denounce it as a blatant Socialist plot. Thus, any specific legislation proposed by Obama would not have gotten past the front gates of 1600 Pennsylvania Ave. before being ridiculed and dismissed out of hand. The commentariat needs to keep its eye on the ball, so to speak. 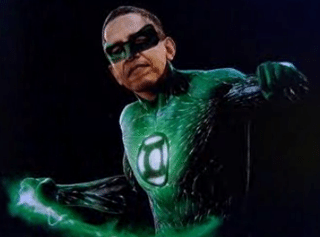 The president doesn’t have some magical “Green Lantern” powers that suddenly give him the ability to bend an intransigent Republican Party that cares about nothing but power for power’s sake to his will. Your premise about the power of the presidency and/or Obama’s I can’t agree with. Obama was the centrist in 2008; his first two years was more Congress bending Obama. He, like Clinton before him, still favors Corporate rule. Were those opportunities missed opportunities or choices? The GOP is illustrating an inherent weakness of democracy; an organized minority refusing to cooperate prevents the institutions from dealing with problem sabotaging the Constitutional system. It’s the Weimar Republic replaced by the Nazi’s, the Spanish Republic overthrown by Fascist Franco. Even if they held the presidency the GOP has no intention of fixing a thing for their agenda is, in the words of their leader Grover Norquist, the destruction of Constitutional representative government (i.e. “Drown in a bathtub…”). “…Obama had large majorities from his own party in both chambers, as had his predecessors.” Your words, Andy. Most people I’ve read on the first term say that the unification of the presidency and the two legislative houses was squandered on the prolonged battle for the Affordable Care Act, which drained whatever resources the divided Democrats had. It was a repeat of the mistake Clinton made at the outset of his presidency. Us socialist commie pinkos also were miffed at the economic team he brought into his cabinet, Summers, Rubin, now Lew (and others), who were banksters, and so engineered a weak response to the foreclosure scandals. Who went to jail? Another problem Obama has with good liberals and progressives is his record as the president most likely to crush whistle blowers and most likely to send the drones half way ’round the world to bomb Muslim villages. Sure, he took down bin Laden, but the cost is being associated now with off-the-books CIA/Blackwater mercenaries. What of the wiretapping and surveillance that continues on American citizens? And the expansion of Homeland Security’s budgets? The Democrats have been hoping that the Republicans have become such junkies for cheap thrills that they’ll fail under the weight of their foolishness. A political party, though, can’t expect to prosper if it doesn’t act on its base principles, and the Democratic party hasn’t. First, on the health care law: What should he have done, not even bother with it? Would the country have been better off had he not attempted to reform our healthcare system (Republican paranoia about what the law actually means/does notwithstanding)? He made it his first and biggest priority, and he knew that he would have to get it done in the first half of the first term, or else risk NOT having large majorities of Dems to work with (turns out he was right, although one can make the argument that Repubs vaulted back into control of the House by using Obamacare as a cudgill). I would argue, clearly, that we are better off (or will be once the law fully kicks in) for having expanded access to healthcare. Personally I’m looking forward to the day when I can get decent insurance at a reasonable cost, which is currently not possible. Is the law perfect? No. It’s still a work in progress, but it’s a good start. Second, your whole drones and Larry Summers and other stuff premise is a total non sequitur. We’re talking about the ability to legislate, to work with and through Congress. And obviously it wasn’t a mistake that “Clinton made at the outset of his presidency,” because Obama managed to actually get something passed, unlike Clinton with regards to healthcare. And if you’ll notice, Clinton set out to actually write the law through his administration (with Hillary leading the charge) and hand it over to Congress. My point is that Obama took a different approach–one that actually required Congress to do its job for a change. Dems in Congress did the heavy lifting. He merely guided the process in the face of non-stop Republican misdirection and outright dishonesty. Look, the guy is a left of center politician. Always has been. He was never this ultra liberal, far left standard bearer. And while I agree with you that at least SOME of the banskters belong in jail (and there’s nothing to say some won’t end up there yet), I think that even you know that it’s a far more complicated issue than that. The obstructionist former head of the FHA certainly didn’t help, which is why he’s now semi-officially been replaced (thank God! assuming the new guy can be confirmed, which in this Senate is far from guaranteed, bordering on unlikely). Some folks need to understand that someone like Dennis Kucinich was never going get elected president. EVER. Left of center – it does beg a definition of left Andy. International observers have described U.S. politics as starting in the center and moving right. In 2008 he was defined by the ruling media as a Centrist. Look at the leadership of the Democratic Party and point out the leftists among them. Socialist not fascist is the dirty word in this country thanks to a steady serving of propaganda. And the banksters, the ones who sold crap and called it gold, well, that’s fraud, larceny. It is a crime. Has been since the 18th Century. 30 years of debt indulgence the true cost is becoming clear; like the Devil demanding his due, we are discovering that we sold our sovereignty. Obama hasn’t failed; Congress hasn’t failed. We have failed. Obama has failed liberals on most things. But I didn’t vote for Obama. I voted against the Republiklans who would have been infinitely worse. And I voted for non-Republiklan Supreme Court justices. I have no hope for immigration reform or the closing of Guantanamo or a foreign policy that isn’t imperialistic in nature or an end to the war on drugs or that the financial industry will be reigned in or pretty much anything that I believe in. Most of that is the fault of the Republiklans. But Obama deserves some blame as well. But, since American democracy is the lesser of two evil, I’ll take Obama over the greater evil of the not-so-GOP. Thanks for this, Andy. It’s perfectly written and researched, and a relief to read some good-old common-sense Liberal analysis. I’m thrilled that I had the chance to vote for the good Liberal Democrat Obama, twice. I’m extremely grateful for the ACA and for Obama’s push to make it happen. He is an excellent president who holds up well despite constantly having to face hateful opponents and unappreciative Democrats. The point is that no matter what Obama did or does, Republicans are not going to support it so why should he spin his wheels and waste his energy only to become totally frustrated? Obama, after having done a great deal of this in his first term, is now reading the Republicans correctly. His approach now is to go around them if he can, shame them if he can, use executive orders where he can and hope for the best. Regardless of what some say about his foreign policy, he has ended one Bush war tragedy and is in the process of ending another. If Romney were in there both wars would be continuing ad infinitum. I believe Obama is doing the best he or anyone else could be doing under almost infinitely trying circumstances.